Areca nut has local name like pineng, pineung (Aceh), pinang (Gayo), batang mayang (Karo), pining (Toba), batang pinang (Minangkabau), and jambe (Sunda, Jawa) (Depkes RI, 1989). 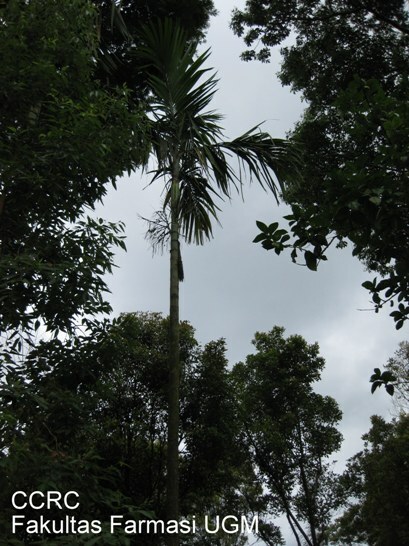 Areca nut classified in division spermatophyte, sub division angiospermae, class monocotyledonae, order arecales, family arecaceae/palmae, genus areca, and species Areca catechu L. (Syamsuhidayat and Hutapea, 1991; Backer and Van Den Brink, 1965). 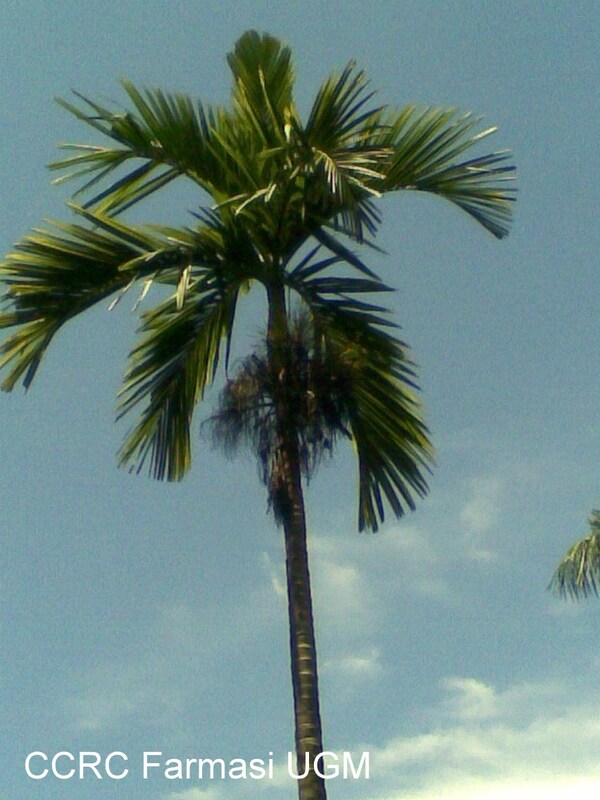 Areca catechu L. (areca nut) is a family of Arecaceae that can reach 15-20 m height with upright stem in 15 cm diameter. The fruit germinate after 1,5 months and 4 months again has the crested little leaves that not yet open. The new stem forming happen after 2 years and fruiting on 5-8 years old depend in the ground situation. This plant flowering at the beginning and end of the rain season and has lifetime around 25-30 years. The seeds of fruit are brownish until reddish brown, lithe curvy with the younger color. In the seed sliced field appear that perisperm is dark brown with irregular crease pierce the whitish endosperm (Depkes RI, 1989). Areca nut seed contain alkaloid, like arekoline (C8 H13 NO2), arekolidine, arekain, guvakolin, guvasine and isoguvasine, tannin condensed, hydrolyzed tannin, flavan, phenolic compound, gallic acid, latex, lignin, evaporates oil and non evaporates oil, also salt (Wang et al., 1996). Nonaka (1989) states that areca nut seed contain proantosianidin, that is a condensed tannin that include in flavonoid group. Proantosianidin has the effect of anti-bacteria, anti-virus, anti-carcinogenic, anti-inflammation, anti-allergy, and vasodilatation (Fine, 2000). Flavonoid fraction (flavonol, antosianin, flavan-3-ol, and proantosianidin) from cranberry extract can inhibit the growth of cells through G1 and G2/M arrest also can induct the apoptosis in breast cancer cell MDA-MB-435 (Ferguson et al., 2004). Whereas proantosianidin in the grape seed has activity for inhibiting the cancer cell growing through down regulation expression Bcl-XL (death inhibitor) so that can induct the apoptosis (Leigh, 2003). This allows the activity of cytotoxic proantosianidin in areca nut also through the same mechanism. Areca nut plants have anticancer potential because have the antioxidant effect, and antimutagenic (Wang et al., 1996; Lee and Choi, 1999). Ethanolic extract of areca nut fruit showing the antioxidant activities with IC50 around 45,4 μg/ml (Lee and Choi, 1999). Areca nut can induct the cell cycle arrest in the culture cell of epithelial oral-KB (Chang et al., 2001). 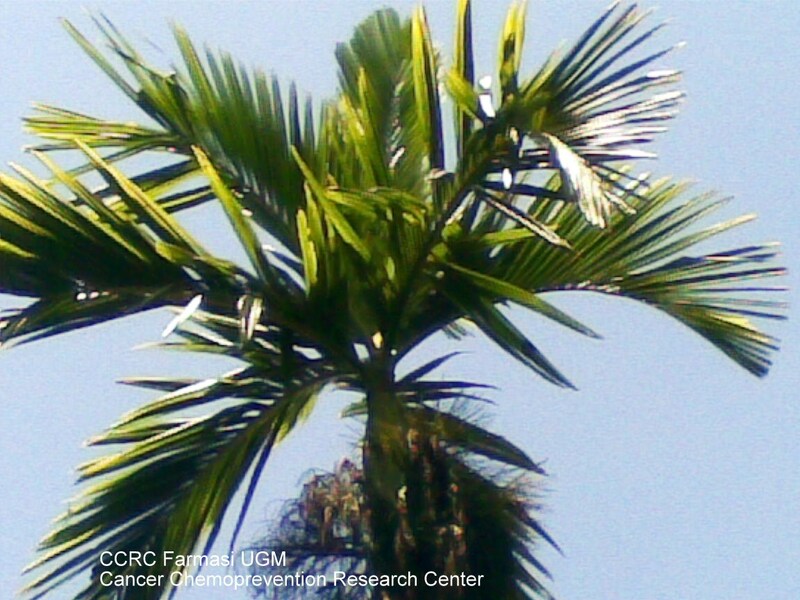 Based on that data, areca nut seeds have potency to be developed as cytotoxic agent that can be combined with chemotherapy agent so that can increase the sensitivity of cancer cell. Backer, C.A., and Van Den Brink, R.C., 1968, Flora of Java (Spermatophytes Only), Noordhoff NV, Groningen, Netherlands, Vol III, p.164-194. Depkes RI, 1989, Materia Medika Indonesia, Jilid V, p. 55-58. Ferguson, P.J., Kurowska, E., Freeman, D.J., dan Koropatnick, D.J., 2004, A Flavonoid Fraction from Cranberry Extract Inhibits Proliferation of Human Tumor Cell Lines, J. Nutr. 134:1529-1535. Fine, A.M., 2000, Oligomeric Proanthocyanidin Complexes: History, Structure, and Phytopharmaceutical Applications, Altern Med Rev, 5(2):144-151. Lee, K.K., and Choi, J.D., 1999, The Effects of Areca Catechu L Extract on Anti-Inflammation and Anti-Melanogenesis, International Journal of Cosmetic Science 21(4):275-284. Leigh, M.J., 2003, Health Benefits of Grape Seed Proanthocyanidin Extract (GSPE), Nutrition Noteworthy, 6(1): article 5. Nonaka, G., 1989, Isolation and structure elucidation of tannins, Pure & Appl. Chem, 61 (3): 357-360. Syamsuhidayat, S.S., Hutapea, J.R., 1991, Inventaris Tanaman Obat Indonesia, Balitbang Departemen Kesehatan, Vol I: 64-65. Wang, C.K., and Lee, W.H., 1996, Separation, Characteristics, and Biological Activities of Phenolics in Areca Fruit, J. Agric. Food Chem., 44(8):2014 -2019.